For the week ending December 25th, 2011, Flowers of War and Flying Swords of Dragon Gate once again held the first and second spots in what was a very good but not great weekend at the Chinese box office. The $71 million cumulative box office total may look good at first glance—indeed, it was the second best week of 2011 after Transformers 3’s opening week in July, and Flowers set a new single-week record for a Chinese film. But the total box office was actually up only 4 percent on a Chinese RMB basis compared with the same week last year. And considering that there are 45 percent more movie screens operating across China now than at this time last year, the past week’s box office looks downright unimpressive by comparison. The problem may have been the oversaturation of Flowers and Flying Swords. Those two pictures grabbed up more than 80 percent of China’s 9,000 screens, leaving little else in the theaters for moviegoers who might have wished to see a different film. The strongest new opener, China Film Group’s romance Dear Enemy, managed just $6.5 million in sales, and the second best, The Allure of Tears, brought in $3.8 million. The rest of the field, a mix of 3 holdovers and 3 new releases, every one of them Chinese, brought in a grand total of $600,000. 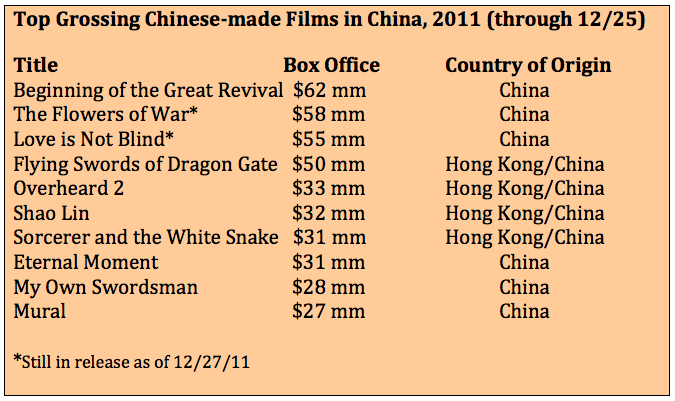 Flowers of War will pass Beginning of the Great Revival this week to become the highest grossing Chinese film of 2011. With a couple more strong weekends it could possibly challenge Kung Fu Panda 2’s $92 million China gross for the number two spot among all films released this year. But even if it does reach that lofty height, Flowers will only recoup a third or so of its negative cost in China. In order to break into the black it will have to gross, at minimum, $120 million in the international marketplace. This has only happened once before for a Chinese film, when Crouching Tiger, Hidden Dragon became a breakout hit in the United States back in 2001. Flowers of War lacks the compelling narrative, the exotic appeal, and the universally resonant themes that Crouching Tiger offered, so the possibility that Flowers might replicate those numbers seems remote. The most important box office news this week is that China’s cumulative gross for the year has definitely crossed $2 billion, making it only the third country in history, after the U.S. and Japan, to reach that mark. Even more remarkably, it was only last year that China crossed the $1 billion mark for the first time ever. The above analysis notwithstanding, a $71 million box office haul in one week would be extraordinary anywhere in the world outside North America; it’s indicative of China’s incredible growth that the number fails to impress only by comparison against last year’s numbers. This entry was posted in Analysis, Box Office Reports, Opinion and tagged Chinese box office, Chinese language films, Crouching TIger Hidden Dragon, Dear Enemy, Flying Swords of Dragon Gate, Kung Fu Panda 2, Rob Cain, Robert Cain, The Allure of Tears, The Flowers of War, Zhang Yimou by chinafilmbiz. Bookmark the permalink.